‘Ello there! The huggable, lovable Pip here! 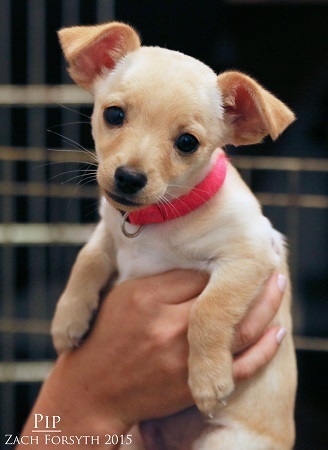 I’m a darling 10 week old Chihuahua that who is a pro snuggler and looking for a like-minded home who has space on the couch for a little guy like me. I promise I won’t take up much room, I’m only about 5 lbs after all!! Since I am a wee one it’s important that I continue my learning by going to puppy classes. Being so kissable and friendly it’s not surprising that I do well in a home with kids and other animals. Do I sound like just the puppy you were looking for? Fill out an application so we can schedule a meet and greet! I am fixed, vaccinated and microchipped. My adoption fee is $300.